Youths who’ve been involved in child welfare systems can live healthy, productive lives, but far too many do not experience positive outcomes by the time they leave government services. High-risk youths often are referred to as “the disconnected” because they rarely have family to rely on or a healthy support network to help guide them; their lives may be filled with risks and characterized by drugs, sexual exploitation, violence, living on the streets, and family breakdown; and they typically have difficulty trusting adults and perceive that they’re alone in the world. These youths aren’t heading in a bad direction or following a path of self-destruction; they’re already there. As a result, it can be difficult for social workers and related professionals to engage these youths, who generally are slow to change and frequently challenge professionals’ practice, ethics, and boundaries. Edmonton and Area Child and Family Services in Alberta, Canada, has acknowledged the challenges that persist in serving high-risk youths. Since 1999, the organization has been developing a practice framework and philosophical approach targeting the most vulnerable youths in the child welfare system. With a focus on building relationships, the project adopted harm reduction and strengths-based/resiliency approaches to engage high-risk youths as well as build community partnerships to maximize the potential of appropriate and consistent services. Not readily accepted or understood by some child protection staff, the project was legitimized in 2005 as a program known as the High-Risk Youth Initiative (HRYI). Over the past 18 months, the initiative has been incorporated into all of the Edmonton child and family services offices, and other regions in Alberta are developing their own HRYIs. The HRYI practice framework incorporates the need for trauma-informed practice since so many high-risk youths experience early childhood trauma, which profoundly impacts brain development and a child’s ability to form attachments. • Value youths and believe they’re worth the effort. Youths’ voices should be heard, and social workers must commit to being creative and flexible. • Be available. 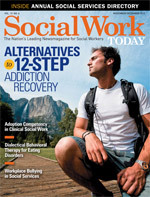 Social workers need to be available both physically and emotionally to accommodate high-risk youths when they’re ready to work on improving their situation. • Go the extra mile. A small thoughtful gesture challenges youths to ask themselves why somebody cares about them and to adjust to this reality. • Be self-aware. Social workers must know who they are both as people and professionals, especially with respect to their beliefs, values, judgments, and power. This can help social workers to become allies in the lives of high-risk youths. Given their life experiences, these youths typically can easily detect others’ genuineness, truth, and integrity. • Communicate a consistent message: “I will not give up on you.” High-risk youths constantly have experienced people giving up on them, so they won’t expect the relationship with their social worker to be different. • Expect to be tested. Given their life experiences, high-risk youths have the right to be skeptical and suspicious. They won’t easily risk being hurt again and will want to know whether the social worker will abandon them or follow through. Social workers must avoid falling into the youths’ beliefs and reinforcing that adults can’t be trusted. • Explore youths’ motivation to change. Fear of failure and change often can be mistaken as lack of motivation. Labels can contribute to this in the form of learned helplessness. It’s often necessary for social workers to hold these youths’ hands at first and to “check in” to ensure the youths feel safe. • Be patient. High-risk youths may not know how to develop healthy relationships, so this will take time. Many youths expect to fail and feel unworthy of help. • Allow trust to evolve naturally. If high-risk youths perceive this is one of the social worker’s goals, they may feel threatened and pull back. Some youths may not develop the capacity to trust while they’re involved with child welfare, so getting to the point where they know their social worker won’t harm them can be significant and allow for progress. • Create healthy confusion. Social workers should be attuned to the needs of high-risk youths and show that there are people who worry about and care for them. The youths’ view of the world as lonely, frightening, and unsafe can be challenged over time, allowing for deeper conversations regarding relationships. • Inspire hope. Social workers should celebrate even the smallest successes and allow these youths to define success as experts of their own lives. • Intentionally interact. Every action and conversation should be carried out in a purposeful, thoughtful, respectful way. Many high-risk youths have shared that they expect the relationship with their child welfare worker to be problematic. Despite this, the HYRI believes that all youths want connection, but attempting to connect with high-risk youths is a risk-filled journey that requires patience (Smyth & Eaton-Erickson, p. 119). High-risk youths typically cannot identify a healthy adult in their lives outside of the professional community, and they often have spent time in multiple placements, including locked facilities (e.g., jail, mental health services). These youths are coping with trauma not only from their earliest days, but they typically continue to face ongoing rejection, abandonment, and violence, making it increasingly more difficult for them to risk allowing anyone into their lives, let alone an adult stranger who is an authority figure. The HRYI has worked toward honoring the voices of high-risk youths, making services more relevant, involving the youths in decisions that impact their lives, and increasing emphasis on face-to-face contact in order to develop meaningful relationships. — Peter Smyth, MSW, RSW, is the specialist for high-risk youth services with Edmonton and Area Child and Family Services. Smyth, P., & Eaton-Erickson, A. (2009). Making the connection: Strategies for working with high-risk youth. In McKay, S., Fuchs, D., & Brown, I (Eds.). Passion for action in child and family services: Voices from the prairies. (pp. 119, 126-139). Regina, Saskatchewan, Canada: Canadian Plains Research Center.